Grafenwoehr, Germany — National Parent Teacher Association, or PTA, has once again recognized Grafenwoehr Elementary School and the Grafenwoehr Elementary School PTA as a National PTA School of Excellence for their achievement in building effective family-school partnerships. Research shows that when families and schools work together, student achievement increases, schools improve and communities grow stronger. Being recognized as a National PTA School of Excellence for demonstrates Grafenwoehr Elementary School and the Grafenwoehr Elementary School PTA’s leadership and on-going commitment to supporting student success and continuous school improvement. National PTA launched its National PTA School of Excellence program to help strengthen family-school partnerships across the country and make measurable progress in the areas of education, health and safety and arts and cultural exploration. As a designated National PTA School of Excellence, families at Grafenwoehr Elementary School feel welcomed and empowered to support student success, and PTA is a key partner for continuous school improvement. Grafenwoehr Elementary School was first recognized as a National PTA School of Excellence in 2014, becoming the first school to receive the designation in Europe; one of only two DoDEA schools to receive the designation (along with Bowley Elementary School in Ft. Bragg, NC); and one of only 175 schools recognized across the United States and Europe. Grafenwoehr and Bowley Elementary, which also received a renewal in status for 2016-2018, are the only two DoDEA schools currently holding the School of Excellence designation since the 2016 closure of Incirlik Unit School on Incirlik Airbase, Turkey. Over the past four years, Grafenwoehr Elementary School and the Grafenwoehr Elementary School PTA have worked together to bring fun, family-focused events like the Grizzly Family Café to the G.E.S. community. Each month, parents have the opportunity to sign up for a special, one-on-one lunch time with their children, allowing them more time to connect around often hectic schedules and welcoming families into the school. The school and the PTA have also teamed up on a wide variety of health & wellness, arts in education, literacy, and anti-bullying initiatives. To celebrate their achievements, National PTA presented Grafenwoehr Elementary School and the Grafenwoehr Elementary School PTA with a National PTA School of Excellence banner, commemorating the renewal of their status for 2016-2018. For more information about the National PTA School of Excellence program, visit PTA.org/Excellence. You can also view National PTA’s press release on this year’s School of Excellence program honorees and the complete list of 2016-2018 National PTA School of Excellence recipients online. 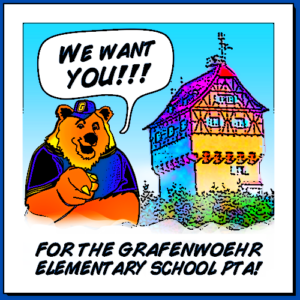 The Grafenwoehr Elementary School PTA® supports the students, families, faculty, staff, and community of Grafenwoehr Elementary School, a Department of Defense Educational Activity school attached to U.S. Army Garrison Bavaria in Grafenwöhr, Germany. The city is located in Bavaria, an area renowned for its beauty and history. Students in grades pre-kindergarten through fifth attend our school, which is fully accredited by the North Central Association.